The aim of the Rainhill Trials was to test steam locomotives under tightly controlled conditions on a simulated journey from Liverpool to Manchester and back again. A prize of £500 would be given to the winner deemed to have advanced the then state of locomotive development. 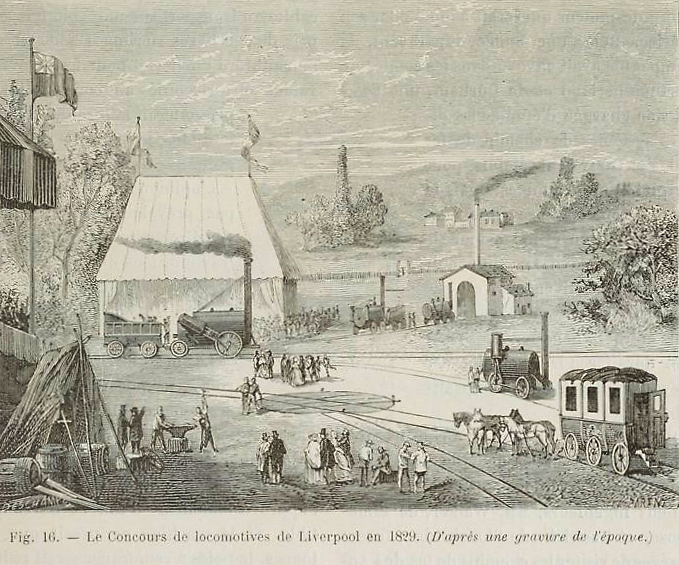 Opinion among the board of the Liverpool & Manchester Railway (L&MR) was divided as to the best means of hauling trains with locomotives favoured by the Prinicipal Engineer, George Stephenson. However, others such as Cropper, a sceptic so far as Stephenson was concerned, preferred an unwieldy series of stationary winding engines. The Trials (0r Ordeal as they were also known) would resolve the pressing question of motive force with (rather optimistic) hopes of at least a partial opening in January 1830. As the track was incomplete in 1829 the distance was achieved by locomotives running a 1.5 mile course from Rainhill to Lea Green, reversing back to the start and repeating the journey 10 times in the morning and a further 10 times in the afternoon. Engines were required to pull a load three times the weight of the engine. A weighbridge was provided at the start to determine the load which was made up of the fuel, water and crew as well as wagons containing variable amounts of stone. The course had the advantage that it was level and complete (apart initially from track) although it was bounded at the western end by the Whiston inclined plane and, more distantly, at the eastern end by the Sutton inclined plane. Both were candidates for stationary engines and it appears a start had been made on housing for the western one. This post will focus on the context of the Trials rather than the day-by-day events which have been well-rehearsed elsewhere. Rainhill at the time was a small village, albeit with some industry (a glassworks) and a stable for some 240 horses used in coaching by the company of Bartholemew Bretherton. The part of the village adjacent to the course already lay at the intersection of two turnpike roads, the Liverpool-Warrington and Eccleston-Cronton, at Kendrick's Cross. The best-known feature of the Rainhill course was the Skew Bridge carrying the Liverpool-Warrington turnpike but this was just one of four bridges shown on the late 1840s map, one of which was probably a footbridge off what is now Kendrick's Fold and Dee Road but then mostly a rough track. Although there were some 65 bridges and tunnels in Henry Booth's official list footbridges were included only under an aggregated head. The bridges (in order, west to east): Stone(y) Lane, unnamed footbridge, Spring (Old) Lane, Rainhill (Skew) Bridge. One discrepancy is that the map shows all apart from the Skew Bridge as being wooden while Booth states that the Spring (now Old) Lane bridge was ashlar, stone and brick. The Stone(y) Lane bridge was wooden with brick piers. An 1831 engraving by Isaac Shaw shows two of the bridges west of the Skew Bridge in the background. The bridges are very different in appearance with the nearmost looking decidedly unwooden (and hence in accord with Booth's account) and the more distant looking like a footbridge (as expected). Whether you could really see all three from that vantage point is moot as another view, albeit from the other side of the track, shows only two bridges. The parsimonious Bury gives us only the Skew Bridge from his perspective (presumably looking east-to-west). In any event there is far more trackside vegetation now to obscure any comparable view. Fig: Rainhill Bridge by Shaw (Science Museum CC NC-BY-SA 4.0). Looking west towards Liverpool, locomotive Planet pulling a luggage train. The bugle may be signalling the approach to the level crossing and adjacent station some 200 m further on. 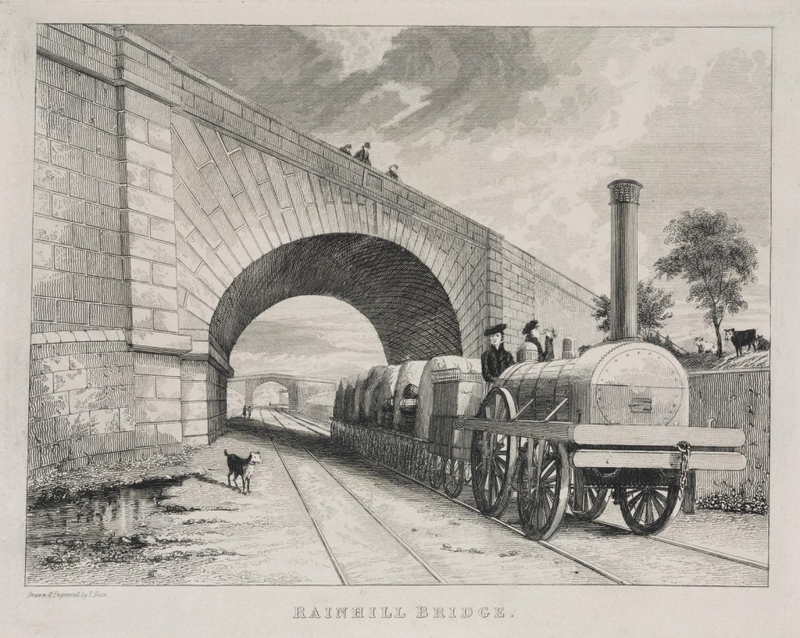 Shaw's print also reinforces the fact that the track ran in a gentle curve through a cutting on its way into Rainhill. While the Trials were held at Rainhill because the track was level, this was only because some 220,000 cubic yards had already been excavated. Moreover, east of Rainhill there is now a low embankment on the way into Lea Green. 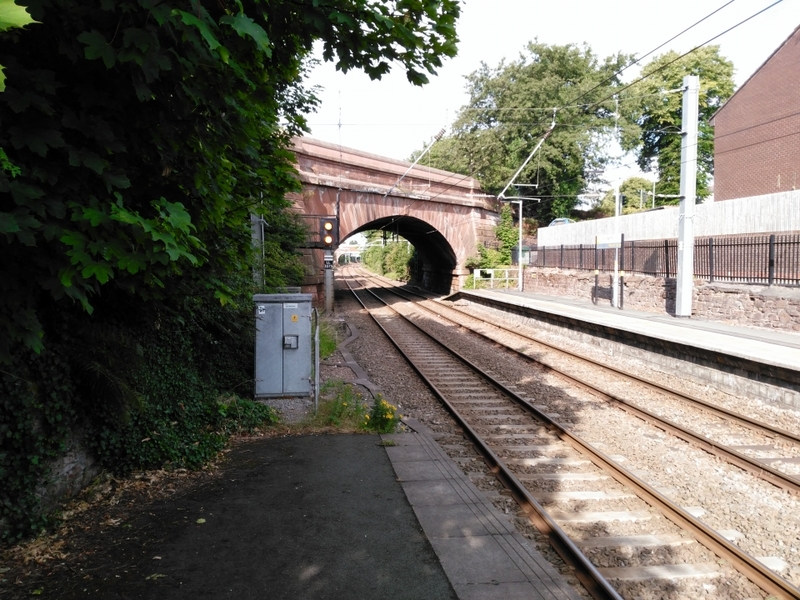 An external assessor, Josiah Jessop, had recommended a deep cutting at Rainhill to avoid the 1:96 gradients at Whiston and Sutton but Stephenson was against this on grounds of cost and delay. This meant that a decision had to be made to manage the inclined planes by means of either stationary or banking engines, locomotives that would push or assist braking from the rear of large luggage (goods) trains. On the first morning of the trials the directors assembled at Huyton and travelled up the Whiston incline to Rainhill in a train hauled by Rocket with Stephenson at the controls. The decision in favour of banking engines was as good as made. As far as the bridges are concerned, all but the Skew Bridge appear to have been subsequently replaced. Stoney Lane became a skew bridge to avoid the awkward Z curve otherwise imposed on the road while the Skew Bridge itself was widened by 4 feet in 1963 to add a second footpath. Three additional footbridges now lie east of the Skew Bridge, including one on the station and one at the junction of Victoria Street and Tasker Terrace, the site of the first station and former level-crossing. A final footbridge appears to maintain a right of way between Ritherup north of the track and the recreation ground to the south although the footpath itself is hard to discern. These days the footbridges allow visitors to see something of the track, the remaining road bridges having had their sidewalls raised following overhead electrification. The Trials had been widely advertised and according to reports there were something like 10-15000 people watching. The spectators were presumably concentrated to the east of the Skew Bridge, the nominated running grounds. If we take the lower number as more probable and assume they were present on both sides of the track for a distance of 1 mile, we would expect a density of about 3 people per metre. Talk of crowds suggests, however, that spectators may have been concentrated at particular points and hence to a degree managed. 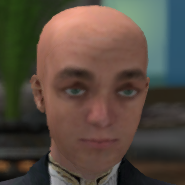 Only part of the course has been modelled in OpenSim. The model shows the permanent way as being fenced off as it presumably was when the railway opened in 1830. This would be to keep animals off the tracks as well as humans. We know, however, that some 300 company employees acted as stewards, i.e. one every 20-ish metres if evenly distributed, so it is is possible that fencing was either partial, absent or thought likely to be ignored. Nevertheless, spectators were not allowed to cross the track unless authorised by the directors. Stewards are notably absent from all supposed images of the Trials. Newspaper reports suggest they were largely ineffectual. The course started to the west of Rainhill where there was a small depot comprising a weighbridge and associated shed together with supplies of fuel, water and stone as makeweight. The course itself was double track with one track extending down the Whiston inclined plane to Huyton. The trains under test did not turn so used just a single line. Famously, one engine over-ran the designated stopping-place on the return journey and continued a short way down the incline beyond. It seems likely that the second track provided logistical support for the depot as well as serving as backup for the trial runs and for exhibition, testing and "pleasure" rides. The exhibition at the Rainhill Library has a useful map (the original dates to the 1929 centenary) of the start location in a cutting between the Stone(y) Lane and Spring (Old) Lane bridges. This is bisected by a footbridge with the starting post to the west and the first time point 220 yards further to the east. The cutting at this point is substantially wider than elsewhere. It later included a siding with a watering station on the south side and to the north a passing siding used by banking engines assisting trains up and down the Whiston inclined plane. Given that these engines were mostly constrained to the incline, it makes sense that the location was relatively self-sufficient. The 1840s map shows a terrace of three cottages west of Stoney Lane Bridge and it seems likely that these were for railway workers associated with the watering station. However, the locomotives used for banking were housed at Whiston at the foot of the incline. The terrace had disappeared by 1850 when permanently stationed banking engines were presumably no longer required or located elsewhere. Although the width of this area in 1829 is unclear, any extra space would doubtless have come in useful for the depot during the Trials and one can imagine space being required for the shed and associated materials and perhaps even for an additional siding. Once weighed, the engine and load were pushed to the running-in point. There was then a 220 yard run-in to the actual first post on the other side of the footbridge during which time the engine had a chance to get up to speed before timing began. There was a judge's tent located at the start line with Rastrick stationed at this end. The guidance to spectators specify that the running would take place on the Manchester side of the bridge which for the most part is true. The course was marked out by posts at 440 yard intervals. One was located at "the bridge" and it is assumed that this refers to the Skew Bridge. However, a contemporary account states that the course ended at the 10 mile post which suggests that the course was based in part on these prexisting markers. If their position was the same as in the 1840s, the bridge post would be more than 100 metres west of the Skew Bridge and could even refer to the Spring Lane bridge. Either way, the track would pass under the Skew Bridge, the most acute on the line and the fourth most expensive to build after the two viaducts and the bridge in Manchester over the River Irwell. The Skew Bridge featured prominently in pictures by both Bury and Shaw. Given that it carried the Liverpool-Prescot-Warrington turnpike over the railway, it offered artists a chance to juxtapose the old and the new with stagecoaches passing above the trains. The next interval post was at the grandstand, a further 440 yards east of the Skew Bridge. However, the most common view of the Trials shows a grandstand next to the Skew Bridge. Thomas (1980) accordingly describes this image as conjectural and, indeed, It seems unlikely that it is contemporary, more an attempt to cram as many points of interest together as possible. Related images, possibly derivatives, show the same content from slightly different angles. It is generally hard to discern the angle of the skew and hence determine whether the grandstand is on the north or south side of the tracks although on balance the north side seems more likely. The provenance of the image is unclear although it is included in the 1868 US edition of the biography of the Stephensons by Samuel Smiles. Others have assigned it to the Illustrated London News. This was first published in 1842 so again it is unlikely to be a contemporary record of events. Newspaper reports indicate that the grandstand was equidistant betweeen the two ends of the course and on the south side, in other words not by the bridge. The grandstand (also referred to as a booth) was apparently provided for ladies only, presumably by invitation, with a band present to entertain them. The number accommodated is unknown. It is plausible that the grandstand was reserved for the wives of engineers, proprietors and select local dignitaries. On that basis its capacity might have been 150-200, i.e. relatively small. Fig: A copy of the "French print", probably a reconstruction but notably lacking the distant Skew Bridge. A corner of the grandstand also features in a supposedly contemporary French engaving reproduced c.1902 by Nansouty. While there are again questionable details, it usefully gives a reverse view that is consistent with some textual descriptions. We know, for example, that there was a maintenance workshop, sheds for the engines (presumably behind the vantage point) and probably a tent for refreshments. The location is plausibly on the meadow to the east of the crossing with Eccleston Hill in the background. This places the grandstand south of the permanent way on what is now the recreation ground or, more likely, on the eastern edge of the adjacent cricket field. This area is flatter than the northern side of the track and it would seem more likely that both the workshop and sheds were on this side. Whether invited guests crossed the track to a tent is plausible only if running ceased at lunchtime (as, admittedly, it probably did). While the French print is consistent with the position of the marker post, it does have some issues. The image of Rocket is similar to that shown in the Illustrated London News save for the presence of a tender lacking a water barrel, an innovation more commonly associated with the Northumbrian locomotive of 1830. The 6-wheeled coach is somewhat incongruous as most carriages at the time seem to have had four. The locomotives are also somewhat mysterious. While Sans Pareil can be made out on the other side of the track (with its leading tender), other obvious candidates are missing (Novelty, Cyclopede, Perseverance) and some unidentified, possibly generic, locomotives substituted. Of course, It is not unlikely that others might have been present, e.g. Lancashire Witch, Twin Sisters, although no sources mention this. Accordingly, it seems unlikely that the French picture is contemporaneous although it has sufficient merit to suggest that it may portray either a reconstruction or a reenactment. According to some accounts, the food provided was distinctly simple, just bread, cheese and beer. Small wonder then that the few local venues, the Rainhill Tavern presumably amongst them, did excellent trade and the latter (termed Railway Tavern by Thomas) set aside a room for the "better class of person" (it is now the Victoria Hotel). Nicholas Robinson, former Liverpool mayor and owner of Sudley, was commended for his foresight in renting a farmhouse in which to entertain his friends, possibly the nearby Ritherup Farm. Other accounts suggest that Melling's works was hired for use as a workshop. A later photograph of the works bears some resemblance to the structure in the French picture but Melling's works was, in fact, located adjacent to the level crossing some 200 m west of the grandstand. It was in any case only opened in 1840 when the L&MR made Melling redundant. Prior to that it had been a glassworks. A second inn or tavern is also mentioned in some accounts but not named. Whether this was the nearby Coach & Horses, if extant, or the more distant Ship Inn, the focus of Bretherton's coaching business, is unclear. Curiously an inn called the Coach & Horses features in the background of a sketch published in 1884 supposedly by James Nasmyth which, according to Anthony Dawson, shows the post-Trials Northumbrian mis-identified as Rocket. 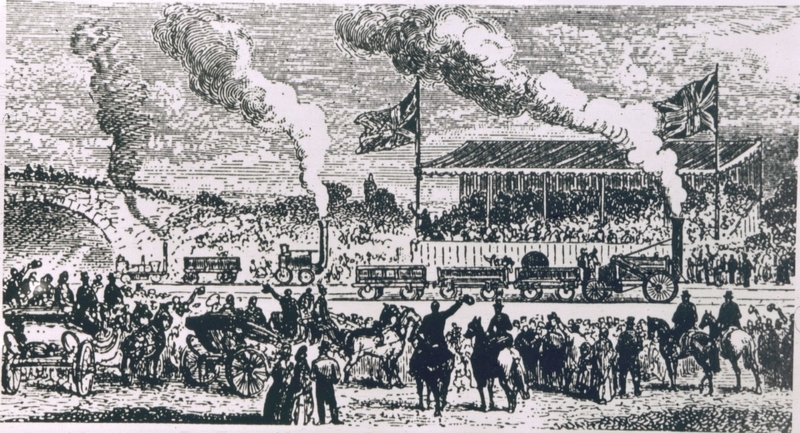 Although Nasmyth indeed claimed to have sketched the locomotive during the Trials, this version is presumably later and based on a sketch of Northumbrian made by Nasmyth on the day before the opening in 1830. The inn and branchline therefore probably represent later artistic embellishment. The build is very provisional as almost no local research has been done and few contemporary resources are available online. However, one potentially useful image is derived from a 3D model built by a local primary school which shows part of Rainhill as it was in 1829. 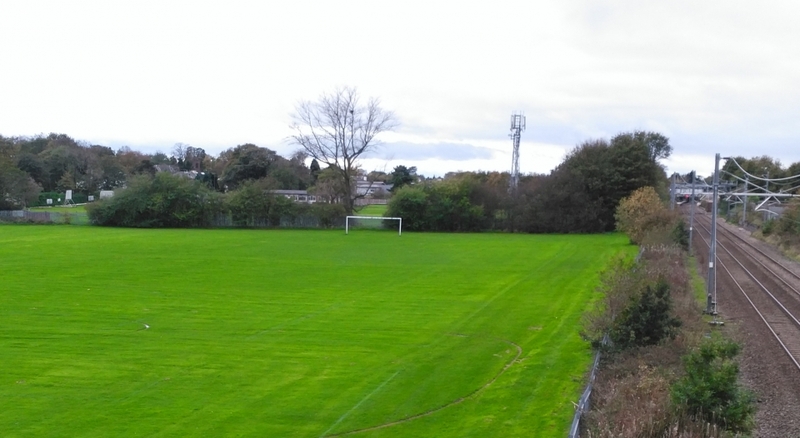 Fig: Rainhill recreation ground, formerly a meadow, from the railway footbridge. Looking west, the grandstand area may have been beyond the hedge and trees to the left, now part of the cricket club. The meadow may have been used by spectators in addition to the area by the Skew Bridge (and probably others). Fig: OpenSim build of Rainhill at the time of the Trials based on the French print. Looking west, the Skew Bridge is in the far distance beyond the level crossing. A gatekeeper's lodge has been included. Although there is no evidence of one being built by this stage, the need to manage the crossing would become increasingly important. The minutes of the Board of Directors indicate that Stephenson was asked to move the gatehouse near Bourne's Colliery, presumably at Lea Green, on 12th July 1830, the reason being that it was too close to the track. It seems likely that the gatehouse at Rainhill would also have been in place by this time. The early station (which this became) was partially destroyed in a serious accident and subsequently rebuilt in the present location by the bridge. Fig: OpenSim model seen from the Skew Bridge looking east. The gates of the level crossing are evident and the grandstand area lies beyond and to the right. The glassworks are to the left and the Rainhill Tavern to the right. While the locomotive performance at Rainhill was recorded in considerable detail, the visual record of the event appears generally suspect. The French print may be more compatible with what little was written at the time and is the basis for the current OpenSim build. However, additional sources are required for purposes of cross-checking and local archives may prove valuable in that regard.